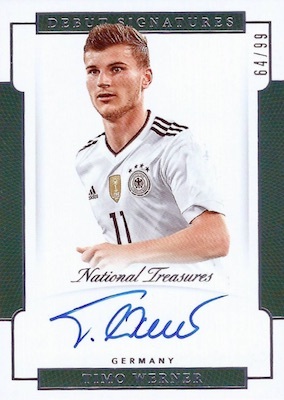 Focused on the national team affiliation for many global stars, 2018 Panini National Treasures Soccer marks the first time NT has been extended to the beautiful game. 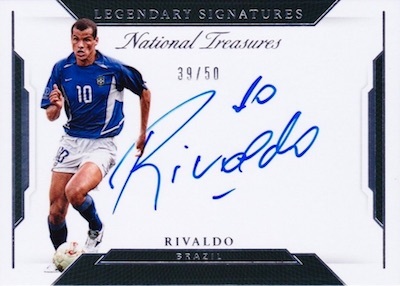 With 10 cards per box, at least four are expected to be autographs and three should be relics, leaving one additional hit. There is also the chance for a ninth box hit with a card that can be a parallel, autograph, memorabilia card, or dual jersey autograph booklet. All cards are numbered to 99 or less. 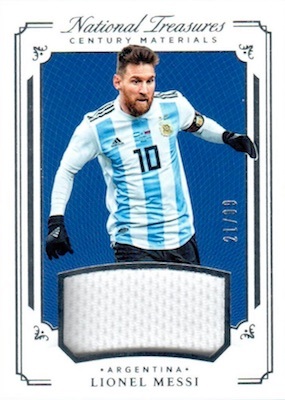 Dropping one per box, the 2018 Panini National Treasures Soccer checklist includes a full assortment of base cards and parallels. However, it's a hit-only affair from here on out. 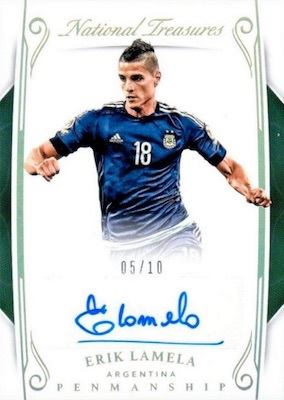 As every box of 2018 Panini National Treasures Soccer contains four autographs, the signed inserts take several forms. Debut Signatures identifies up-and-coming stars, including the first on-card autographs for Michy Batshuayi and Philippe Coutinho. 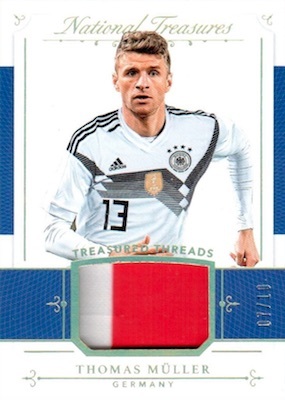 These also have low-numbered Bronze (#/25), Gold (#/10) and Platinum (1/1) parallels, plus photo variations with a special notation on the back of the card. More signatures enter the mix with Penmanship, International Treasures Material Autographs and the one-of-one A Class of Their Own. 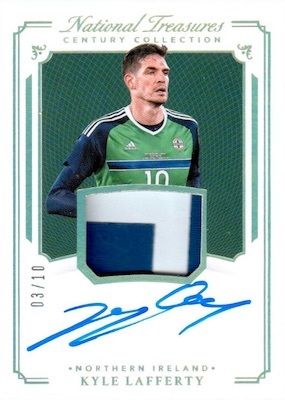 In addition, 2018 Panini National Treasures Soccer features Triple Signature cards and the case-hit Dual Jersey Autographs booklet set. 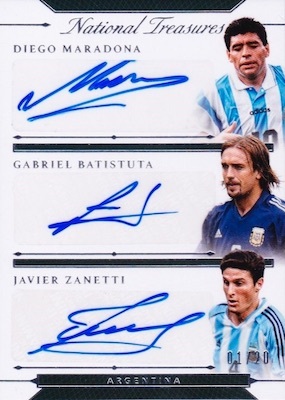 Nearly matching the autographs, collectors should uncover at least three memorabilia cards in each box. Choices include Brand Logos (1/1), Century Materials, Colossal Materials, and Tremendous Treasures. 2018 FEDERICO MARCHETTI PANINI NATIONAL TREASURES PENMANSHIP AUTO 02 10!! 100 cards. Serial numbered #/50. PARALLEL CARDS: Bronze #/25, Gold #/10, Emerald #/5, Platinum 1/1. 14 cards. Serial numbered 1/1. PARALLEL CARDS: Bronze #/25 or less, Gold #/10 or #/5, Platinum 1/1. PARALLEL CARDS: Bronze #/35 or less, Gold #/10 (Cristiano #/5*), Platinum 1/1. PARALLEL CARDS: Bronze #/35 (No Martial*), Gold #/10 (Martial #/8*), Platinum 1/1. PARALLEL CARDS: Bronze #/25, Gold #/10, Platinum 1/1. PARALLEL CARDS: Bronze #/15 or less, Gold #/10 or less, Platinum 1/1. 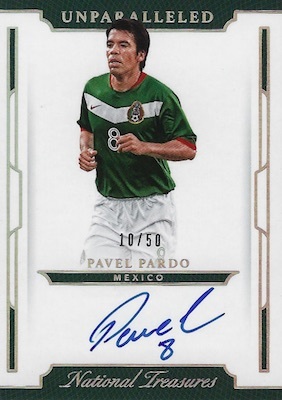 PARALLEL CARDS: Bronze #/25 or less, Gold #/10 (Pjanic/Dzeko #/5*), Platinum 1/1. PARALLEL CARDS: Bronze #/25 or #/10, Gold #/10 or #/5, Platinum 1/1. 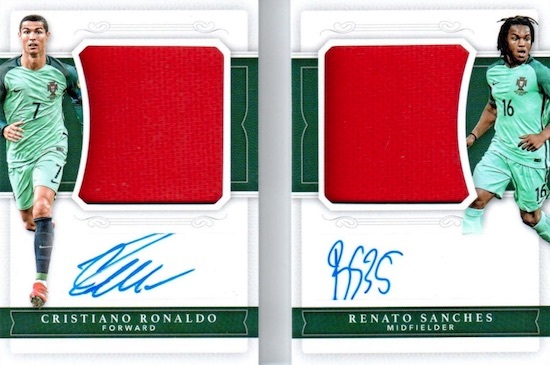 PARALLEL CARDS: Bronze #/35 (Cristiano #/15; No Hart*), Gold #/10, Emerald #/5, Platinum 1/1. 61 cards. Serial numbered 1/1. 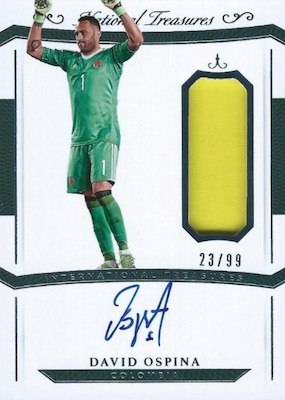 PARALLEL CARDS: Bronze #/35 or less (No Pulisic*), Gold #/10, Emerald #/5, Platinum 1/1 (No Fellaini*). 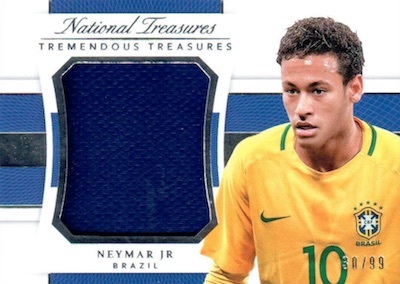 View the 2018 Panini National Treasures Soccer checklist spreadsheet. 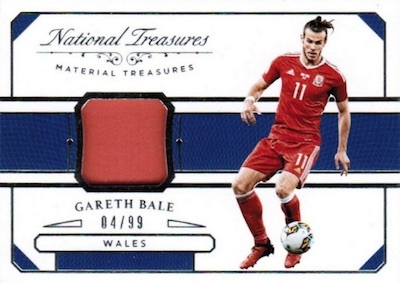 2018 Panini National Treasures Soccer is honestly a hit and mix product at $500 a Box or $1,900 a case You can seriously take a Financial beating. 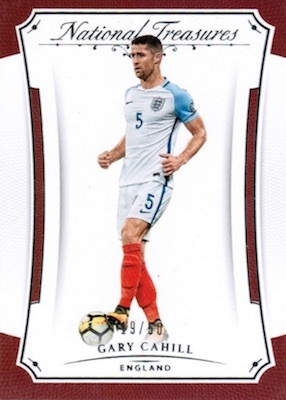 What I hated about this product is that Panini Decided to rush this product to market in time for the world cup when product sales would be at it highest. Leaving a lot of collectors seeing a ton of redemption cards online.